It’s finally getting warmer here in Los Angeles, and that means more salads. It also means more time spent outside...and notably less time spent in the kitchen. 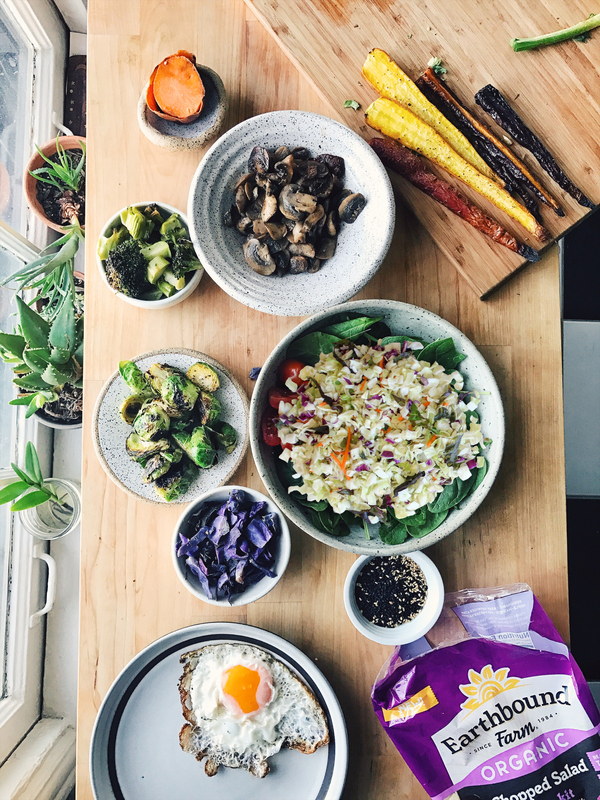 That's why today, I’m sharing a really special macro bowl recipe with you guys in partnership with TheFeedFeed & Earthbound Farm Organic - Earthbound Farm has a great new chopped salad kit that makes preparing this salad easy and something that can be done well in advance! While this recipe calls for the Asian Chopped Kit - they also make BBQ Ranch & Southwest - all of them equally as easy to work with. I eat a huge salad for lunch everyday, whether it's spring summer fall or winter. They are super satisfying both physically and mentally - they nourish the body and the soul. If you're like me, you want to make lunch as quick as possible- without spending all morning in the kitchen. That's why I stress meal prep in this recipe (and in life) roasting the veggies in the beginning of the week and store them in glass air-tight containers. That way you can just reach for the ingredients when you’re in a pinch for a healthy lunch on-the-go. Feel free to prep the first 9 ingredients ahead of time and store in individual containers in your fridge. Prep them the way I do below, and that way, you can make a bowl full of different goodies everyday and never get sick of the endless combo's! Toss Brussels sprouts, carrots, fennel, and broccoli with 3 tbsp olive oil, salt and pepper to taste in a large mixing bowl until well coated. Place on a baking pan and bake for 35 minutes or until golden brown and fragrant. While veggies are roasting, sautée your mushrooms in 1 tbsp olive oil over medium heat in a cast iron skillet. Lightly salt them. Cook for 10 minutes, stirring occasionally until translucent and lightly crusted. Set aside. Next, add 1 tbsp olive oil and 1 tsp fennel seeds to the same cast iron skillet your mushrooms just cooked in. Cook over low-medium heat until seeds are fragrant. Add sliced cabbage. Stir occasionally until tender. Set aside. Remove salad kit from the bag and assemble all the ingredients together in a clean mixing bowl, tossing with ¾ of the tahini dressing. Heat 1 tsp coconut oil in a cast iron pan over medium heat until hot. Splash water onto pan to see if it sizzles. Then, you know your pan is ready. Crack an egg into the middle of the pan. Let egg whites set, then spoon excess oil onto the egg whites to help them cook and brown. Remove from heat once yolk sets, about 3-4 minutes. Set aside. Place baby spinach at the bottom of your salad bowl. Next, add a small section of Earthbound Organic Chopped Salad Kit, then some mushrooms, followed by broccoli, fennel, carrots, scallions, sweet potato, Brussels, cabbage, and cherry tomatoes. Top with a fried egg. Sprinkle with sesame seeds and scallions. Drizzle with the rest of the tahini dressing over the top. Enjoy!